Today's post is a re-print from my post over at the Zwaggle blog. And if you don't know Zwaggle, run on over there and get familiar. Yes, both of you. Thanks, now on to today's post. Wake up to the words, “My bed is wet, Mama.” For some reason, you feel compelled to check for yourself instead of just stripping the bed, as if your child would lie about such a thing just for kicks. Notice that the bed is not just damp, but that it rivals the swampy conditions found in the Everglades. On the way to school, categorize and prioritize your day’s tasks thusly: Should-do, Need-to, Said-I-would, Have-to, Dying-to. (Rearrange these several times during the day, until you have ignored them all.) Drop off your child at school. When the teacher tells you that there is now a confirmed case of pink eye circulating the school in addition to foot and mouth disease, rotovirus, and head lice, heave an audible sigh. Go to work at your desk, for example, and clear your schedule for the next five to seven days, knowing that your child is certain to catch all four ailments that day. Repeat, until June. During the day, give yourself a headache asking yourself why you’re not doing more with your life. If you have a full bottle of pain reliever around (Motrin, if you’re not swayed by advertising controversy), draw harsh comparisons between yourself and those you consider to be “successful.” Forgo drinking water and eating healthy foods that day in favor of consuming only those things consisting of caffeine and/or salt. When the economy tanks, pretend to understand why you should be freaking out, then secretly congratulate yourself for not having any money to lose in the financial black hole of 2008. When you notice the fallout directly affecting you in the form of a sharply reduced income—say a reduction along the lines of one hundred percent—genuinely freak out. To avoid worrying others, do your freaking out between the hours of 3 and 5 AM. Repeat, until June. At the end of one of your daily freak out sessions, realize, very abruptly, that you’re 39 years old. (How did that happen?) Decide to become a librarian, based on someone once telling you that the average age of Library Science students is 39. Or is it the mean age? Try and remember what the difference is between averages and means. Forget it; write down, “become a librarian” on a slip of paper and leave it on the nightstand so that you can look into it later. Find it the next day while you’re straightening up, and misread your own handwriting as, “become a libertarian.” Scratch your head, and try to remember why it seemed like a good idea to drastically change your political affiliation. Start a magazine, a radio show, or secret society by reserving the domain name. Then, run completely out of juice writing the mission statement. Seconds into transforming yourself into a member of the libertarian party, stop short and gasp. What if the note you wrote said “lesbian,” not “libertarian?” Imagine the changes you’ll have to make. In an attempt to entertain and distract you from yourself, see David Sedaris in concert. Instead of enjoying the show, spend the time asking yourself, “Why can’t I do that?” Go home, write down, “Become an author who writes funny little stories about life and reads them aloud to audiences around the world. Rake in the dough.” The next morning, decide that it would be enough simply to spend a few minutes writing a funny little story. Feel a little better, a little happier, a little lighter. Make the bed. Congratulate yourself while you go to the sink to wash your face. Try not to curse aloud upon discovering that you have pink eye. What a relief: Election day. Today we not only get a new president; we get a break from the phone calls and door knockings asking us if we've voted. For someone who is already asked to repeat herself five thousand times a day because she lives with a four year old and a grown man with ADHD, OCD, and a few other initials, the civic commitment of some people and organizations came as particularly bad news. Because I work at home, I'm forced to answer calls from unfamiliar numbers in case they pertain to something lucrative. Instead, it was often a recording of a plumber in Denver named Joe, who doesn't care for a certain candidate stereotyping his identity for the benefit of ideals he doesn't support. Or it was a woman in Duluth who told me I was a "good girl" after I gave her what she considered the good news. Weeks ago, I'd voted by mail, an act that I thought would save me from all the hoopla, like the long lines and archaic practices of punching pieces of paper with a stylus that I would secretly sterilize with a Lysol wipe before touching. 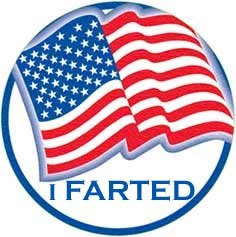 So last night, much too late to make any kind of material gain from it (my timing is always this spot-on), I made a little sticker, as much to amuse myself as to keep others from asking me if I've voted. I've passed it, much like the dutchie, to the left hand side. Feel free to use it at your blog, and wherever else you like. Personally, I think Benjamin Franklin would be proud.